INSIDE : Get yourself organized with metal IKEA locker style storage ideas and ways to customize each compartment. There are so many great organizing hacks when using Lockers as spare Storage! I have long been keeping my eye on these vertical Ikea metal locker cabinets ( IKEA lockers white, IKEA lockers blue and similar). And finally after much research and anticipation, I headed to off to Ikea and purchased two of them in a dusty blue color! However, I quickly became completely paralyzed with excitement at all the storage possibilities. And since these are metal Ikea lockers, there are so many fun magnetic accessories you can add to them. See a few of the fun ideas, below. 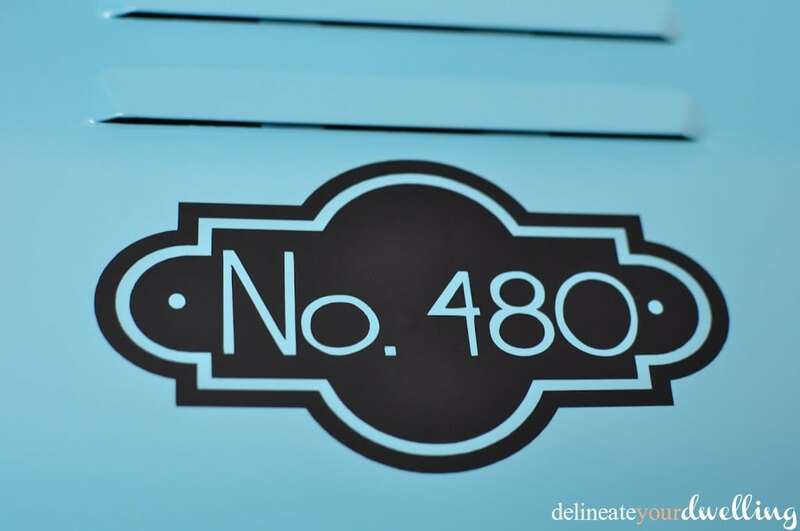 The first thing to decide upon after buying lockers for storage is where should they be located? 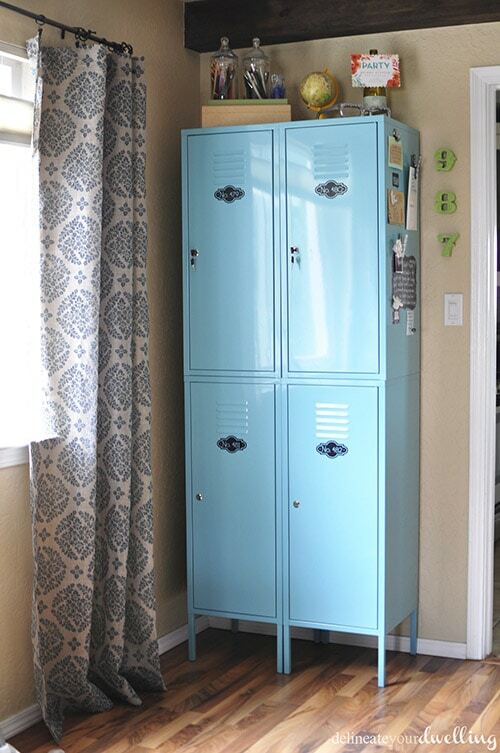 Many people use locker storage in mudrooms or even them in entryways. Ultimately we didn’t really have the space in either of those types of locations, so I put mine in our dining room. I could not decide if I should use the locker storage for holding entertaining type items ; placemats, candle holders, serving trays, etc… or possibly my crafting supplies. I ended up doing a poll and everyone seemed to be guiding me in the same direction with using them as craft storage. However, I was not so sure all of my crafts would fit inside the two of them. I finally decided why not at least give it a try. Lo and behold, all my craft stuff fits in ONE locker! I keep thinking I might have more crafty things hiding in a closet somewhere… there just is no way. Other than my larger crafting items; sewing machine, spare fabric and Silhouette printer that I have upstairs in our office area – EVERYTHING else fits in these lockers! Now that I know what I will use my lockers for, they will still needs some major organizing. I have a hunch I will be making quite a few trips to The Container Store for all kinds of bins and crates! I plan to get some labels going on, some fun containers instead of the mismatch and cram it where it fits thing. Somehow I will organize all my thank you and greeting cards and incorporate a few mason jars because I mean, what kind of DIY blogger would I be if my craft space didn’t include mason jars?! 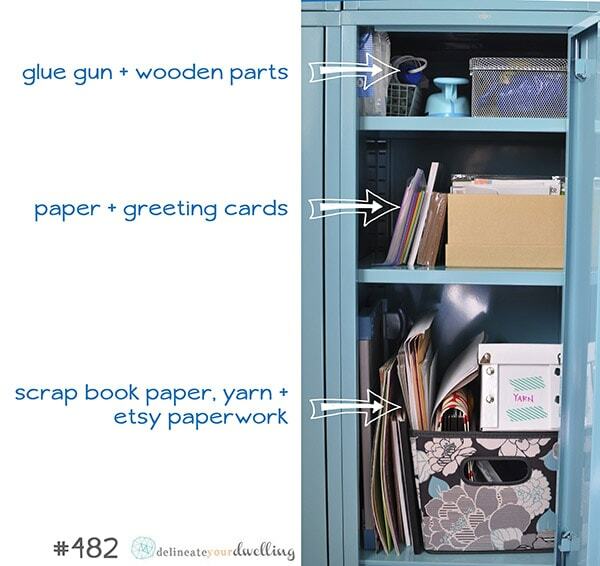 You can see all of my amazing locker organization like the below image, on my Locker Lovin’post. I added a few decals with my Silhouette printer to spiff up the locker fronts. I found a basic plate file and then added numbers to the center. With a few clicks of my silhouette, I had made four numbered labels for my lockers. I think they add such a fun detail to each area! 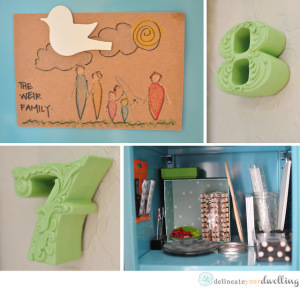 And be sure to see ALL these fun decorative details of how I am using these lockers now on my Locker Lovin post. Love the lockers, but i ADORE the curtains!! Where did you get those? Just saw all your beautiful lockers and storage ideas! If you have trouble finding more lockers – please check out my shop on Etsy (Artspace Industrial). I always have a decent stock of standard 12″w lockers and sometimes 15″ & 18″w as well. Let me know if you send people my way and I’ll help support your site as well. Love your posts! Oh! Photo box for bead storage! What a great idea! Where did I put that photo box…? So sad, I think they’ve stopped carrying the lockers! I don’t know why, they are so great. Your lockers look fabulous! Great color, and all your stuff looks so pretty inside! Mine is always a big mess lol! Thanks Christine! I literally RAN to Ikea when I saw they had them!! I just started following you via Bloglovin’. I am so jealous of that locker! I love it – the blue color is amazing! I wish I had somewhere to put something like that! Thanks Ashley! I kind of freaked out and drove like a mad woman to Ikea when I saw they were selling them! Oh my goodness! I am loving the locker!! That shade of blue is the perfect pop of color! Also loving how organized everything looks! 🙂 Can’t wait to read more!! Thanks Shelby! It’s definitely a work in progress getting things in the right place, but I’m loving the pop of blue!